Brazil's top mincecore demons are back and in a big way! This 33 song CD is the perfect example of why this band has been turning heads all over the international underground. It is packed full of totally over the top pulverizing mayhem. 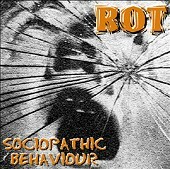 ROT play a savage and nefarious style of grindcore that is stripped to the bone and as raw as roadkill. No frills, no embellishments and nothing fancy on here. Instead ROT relying on bludgeoning brutality to make their point. Adding to the effectiveness of their delivery on "Sociopathic Behaviour" is the production. Like their previous stuff it is very primitive and basic but this time around there is good definition between the different instruments lending the CD a clarity they have heretofore lacked. ROT are not for the meek but if you fancy yourself a disciple of the extreme you may want to track this one down.